Cumin has such a distinctive taste, and I can't imagine certain types of food, such as Mexican, or Middle-Eastern, made without it. I keep cumin seed and ground cumin on hand at all times. I can't resist the sweet smokey taste it lends to food and usually get heavy handed with it. It certainly tasted good in this stew. There is a mystery to this recipe. The pictures of it in Food & Wine, show a stew with a pale green sauce. My stew used the requisite amount of tomatillos, but turned out bright red. Food & Wine's picture? Nary a trace of red. I'm wondering if the magazine left out the large amount of red tomatoes, for the appearance of the dish? How can you add that many tomatoes and not have a red sauce? I'm just saying. And any dish that gives you an opportunity to eat tortilla chips is just fine by me. In a medium casserole or Dutch oven, heat the oil. Season the chicken with salt and pepper and cook over high heat until browned on 2 sides, about 2 minutes per side. Add the celery and onion and cook over moderate heat, stirring occasionally, until softened, about 7 minutes. Add the diced chile, garlic, chile powder, cumin and oregano and cook, stirring frequently, until fragrant, about 3 minutes. Add the chicken stock and bring to a boil. 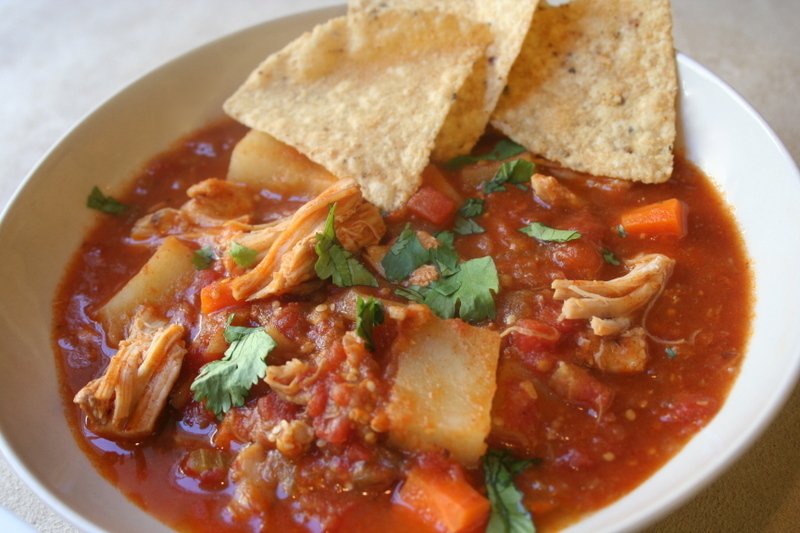 Add the carrots, potatoes, tomatoes and tomatillos, cover and simmer over low heat until the chicken is cooked through, about 25 minutes. Transfer the chicken to a plate and shred with two forks. Meanwhile, simmer the stew over moderate heat until thickened, about 10 minutes. Stir the shredded chicken into the stew and season with salt, pepper and hot sauce. 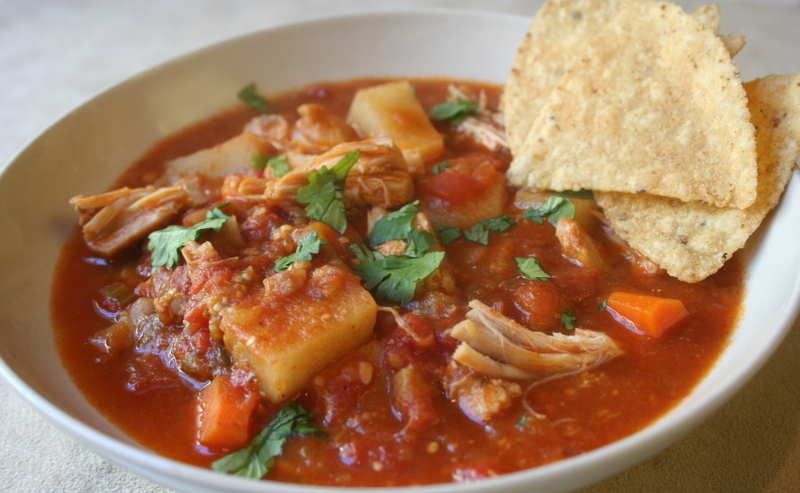 Ladle the stew into bowls, garnish with chopped cilantro and serve with a few tortilla chips. Ummm...very odd indeed. I would think red would cancel green from that ingredient list. Maybe they didn't use the red tomatoes or maybe they used PhotoShop. Anyway, yours looks lovely, I'll have a bowl and lots of chips please! Food and Wine's green picture? I have no idea. But I love dishes that are really better when they're made ahead. It's nice to have something you can make for the next day's meal. This stew is just my kind of thing! 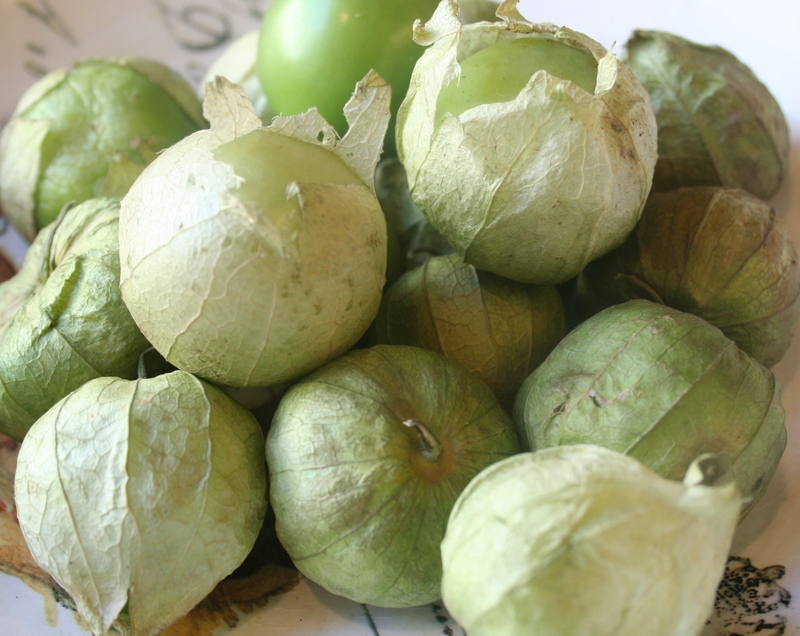 And your photo of the tomatillos is beautiful. That looks really good and sounds tasty. I just discovered tomatillos recently and enjoyed them in a chili verde. Delicious!!!!!!! I too love the photo of tomatillos. They are rare in Australia (wonder why) so I can't try your recipe as yet. But I am VERY keen! Very delicious. I love tomatillos. Very funny about the photo colors being different. I wonder if they made it differently than the recipe they posted, not realizing it! This looks very warming as it's c-c-c-cold tonight...may I have seconds? Sher, a mystery indeed. I also thought usually when using tomatillos, one naturally used less tomatoes, but what do I know? My girlfriend planted some and they were tiny about the size of your pinky nail! My God! That is SO my kind of food. Tagging immediately for future reference! Oh my goodness! This looks sooooo delicious. And I've got tomatillos growing in the greenhouse. Got to make me some of this! Thanks Sher. Thank you for taking part at the WHB! I've come to love cumin over the last few years, using it quite frequently in our kitchen - a lovely warm spice! Made this last night, finally! Delicious, and so easy--will definitely be a regular in the house. Thanks for sharing! i love this spontaneous style of cokiong - it's so me. the fall flavours are so what i am in the mood for.i tried you new mexican baked potatoes as a sunday dinner with the whole extended family - went over very well. i can't say i followed the recipe exactly, as i am prone to improvisation, but thanks for the inspiration, which you continually provide!